Remus has to die | continent. One of the most famous fratricides in the world’s mythology is the one of Romulus and Remus. Similarly to Cain killing his brother Abel in the Bible and Qur’an, or Seth killing his brother Osiris in Egyptian mythology, it is written that Ancient Rome was founded on a murder between two brothers. 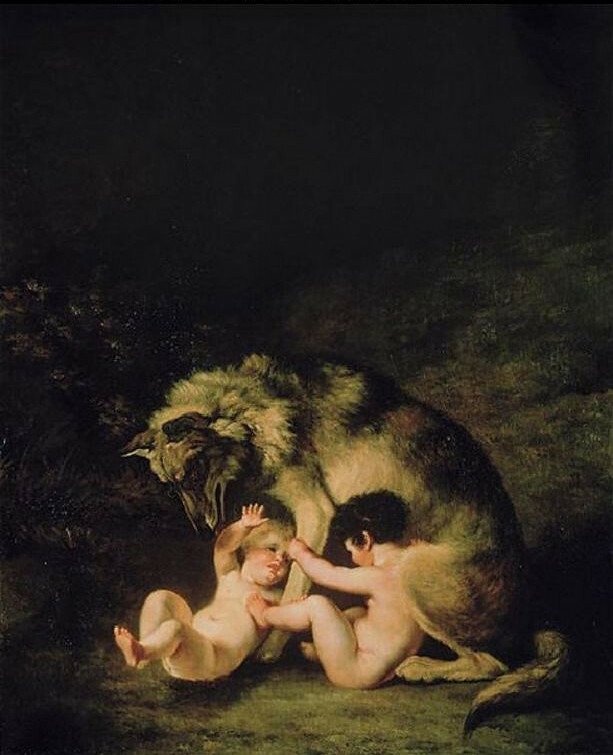 Romulus and Remus have been abandoned by their mother, fed by a female wolf and raised by a couple of shepherds. They both wanted to found a new city on one of the hills that are now part of Rome. Having interpreted the auguries in his favor, Romulus started digging a trench around what was to be his new city. In protest, Remus, who had another interpretation of the auguries, jumped over the trench and his brother killed him. The new city, named after Romulus, was born. Many of us know this story, but it is interesting to re-read it through the filter of architecture and the law. When Romulus digs a trench around the future city, he circumscribes and appropriates a territory. In other words, he proclaims his property and a form of control over it. This would not be possible without a modification of the physical environment. This is why he dug a trench, but he could have built a fence or a wall. Architecture, understood as a voluntary physical act on its material context — in this context, a wall or a trench can both legitimately be called architecture — is used to implement the law. We can also observe that what we call the law can be unilaterally declared, and can thus surround and subjugate each body present on the territory, on which it applies. It is therefore important that architecture delimits the territory, given that one of the axioms of the law is that anybody who is subject to it is supposed to know about it. Just as when Julius Caesar crosses the Rubicon, when Remus jumps the trench, he is fully aware of his trespassing; in fact, he is so much aware of it, that his entire action constitutes a protest against it. In other words, Remus does not jump the trench because he actually wants to reach the other side; rather, he does so to manifest the nullity of this boundary imposed upon him. This may dramatize an ethics of disobedience: breaking the law not for one’s own interest, but rather as a protest against the law itself. The trench is the material manifestation of a diagram imagined in Romulus’ head. In that sense, Romulus was the first Roman architect, as with his trench, he ‘drew’ a line that would subjugate the bodies and implement a law — the two are almost the same: architecture can be understood as the materialization (and thus the means of enforcement) of the diagrammatic law. Law and architecture form an assemblage that organizes bodies in space. For this reason, when Remus crosses this line, not only does he disobey the law, but he also manifests a clear denial of the power of architecture, as if passing through a wall. Through his gesture, he subverts the order composed together by the law and architecture, since he manifests the nullity of the legal and architectural apparatus that imposes upon his body—to remain on one side of its line, outside the city limit. If Remus had not been punished by his brother, as the law he himself drafted anticipates, the foundation of the new city would have been null and void. In order for Rome to exist from this moment, Remus had to die. What we can hope, as funambulists, trying to walk on lines rather than letting them subject our bodies, is that the body of Remus was buried inside the trench — it would thus serve its double function of wall and grave — in the thickness of the line of Romulus’ property diagram. The narrow physical space of the line is indeed a geometrical impossibility within the legal diagram — lines have a length but no thickness — and therefore no law can be thought to be applied within it. Remus’ body would therefore be liberated from the law forever, and Rome would own in its walls the mark of the disobedience that triggered its founding murder. Léopold Lambert is a Paris-based architect and editor-in-chief of The Funambulist Magazine and its podcast, Archipelago, that both attempt to raise questions around the politics of the built environment in relation to the bodies. He is the author of Weaponized Architecture: The Impossibility of Innocence (dpr-barcelona, 2012), Topie Impitoyable: The Corporeal Politics of the Cloth, the Wall, and the Street (punctum, forthcoming 2015) and Politique du Bulldozer (B2, forthcoming 2015).